Earth presents Earth Techone or Tech One - a trendsetting commercial space for office complex, based on 'Work and Play' concept. Tech One is Earth's infamous IT & ITES project designed to carter world-class office space to top-notch companies in India. As the project is for IT & ITES companies, IT giants & software hubs etc it matches the global infrastructure. On the other hand the Earth Techone offers ready to move-in fully furnished studio apartments,furnished office spaces & a high end commercial with entertainment zone with Earth Alpha Tech, Beta Tech ,Gamma Tech & Earth Expressone . 350 / 500 / 750 / 1000 sq. ft.
· Just opposite to Gautam Buddha University – Asia’s largest university spread over 550 Acres. 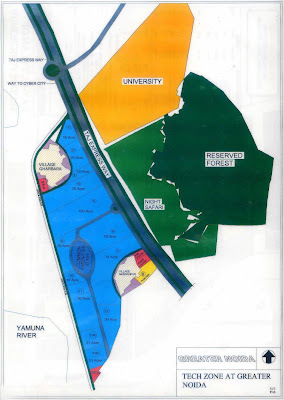 · Within 650 acres Tech Zone. It is really great to have a place where real estate managers are so responsive and pleasant to work with! I would highly recommend finding a good real estate agent to anyone who is looking for a new place to move. Earth Techone is nice project !